The Local Council of the Russian Orthodox Church is in Moscow to elect a new Patriarch of Moscow and All Russia. Metropolitan Filaret of Minsk and Slutsk has withdrawn from the election, leaving just two candidates. Originally, Metropolitans Kirill, Kliment and Filaret had been shortlisted as potential successors to Alexy II, who died last month. They were elected by secret ballot on Sunday from 145 potential candidates. They were elected by secret ballot on Sunday from 145 potential candidates. For the first time, international candidates are eligible to stand. Patriarchs from Ukraine, Moldova and Germany are in the Russian capital for the vote. Metropolitan Kirill is believed to be the strongest contender. Currently the church’s interim leader, he is known as an articulate public speaker well aware of worldly concerns. “The Greek word for ”crisis“ can be translated into Russian as judgment. Any crisis in life is a divine judgment. This divine judgment separates truth from lies. The economic crisis we face today reveals some global falsehood. It didn’t originate in Russia but we still feel its cold breath,” said Metropolitan Kirill at a recent service. Born in St. Petersburg, Kirill is believed to be on friendly terms with many of Russia’s top officials. But some say it doesn’t necessarily strengthen his bid. “Metropolitan Kirill is a very prominent person. This quality attracts secular people. But this is also something that causes some feelings of discomfort within church circles. That's why I assume a considerable part of the Council will vote in protest – anybody but Kirill,” Deacon Andrey Kuraev from the Moscow Orthodox Christian Academy said. Campaigning is not allowed. The only thing this election has in common with political races are these ballot slips, published at the same printing house that made forms for the most recent presidential vote. On Sunday, members of the Archbishop Council will narrow the field to a shortlist of three candidates for the church’s highest post. Later, a wider panel of hierarchs, monks and laymen will select the worthiest. “There are several qualities mandatory for a patriarch. First of all, he has to be experienced in terms of age. So he cannot be younger than 40. He has to be an archbishop and therefore has to possess some experience of managing religious affairs. And finally he has to have a good reputation with his flock and beyond,” Father Savva from the Church's external committee said. Another candidate with a chance is Metropolitan Kliment of Kaluga and Borovsk. In charge of the church’s economic affairs, he was one of the Alexy II’s closest associates. Unlike Kirill, Kliment has always tried to stay out of the limelight. Both candidates, however, represent the more traditional wing of the church. “They want to make the church a stronger institution; they want to strenghten the insitutional aspect of the church. And I'm afraid they don't pay much attention to the community aspect of the church,” Boris Falikov of the Center for Comparative Religious Studies said. 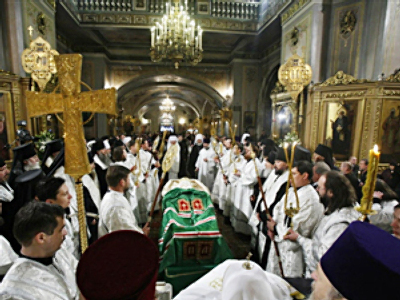 According to polls, more than 70 per cent of Russians consider themselves Orthodox Christians. But only one in ten goes to church at least once a month. Almost half say they never pray. The late patriarch Alexy II spared no efforts in strengthening Orthodoxy, building thousands of churches and winning support from the state. But his successor may have a heavier cross to bear. Millions of Russians see religion more as a social declaration than a spiritual guide. Converting the converted may prove even harder than rebuilding cathedrals.